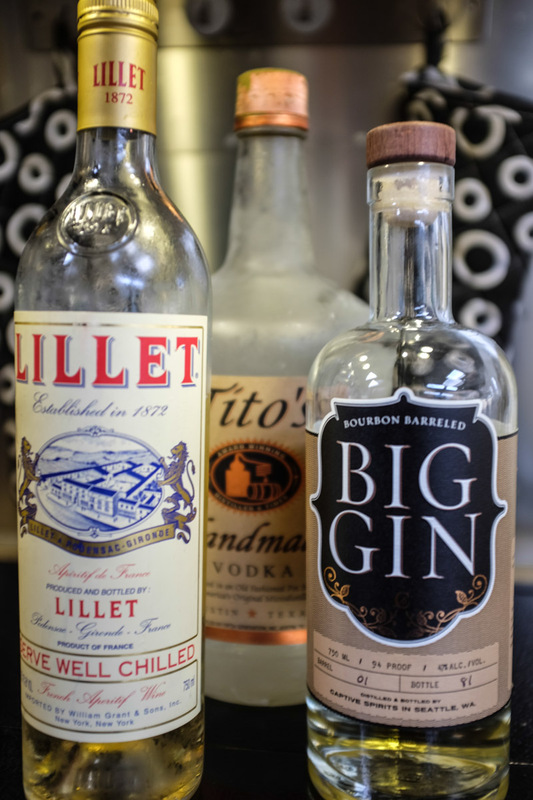 We've been substituting manhattans or vespers when we feel like a martini…just to mix things up a bit. We hate to be predictable. This is our recent favorite…I call it the Big Gin Vesper. A vesper is typically gin, vodka, and Lillet and originated in the 1953 James Bond novel Casino Royale. You can geek out on the history of the cocktail here. We've had the standard one and it's good, but we decided to try it using a new gin we got when we went up to the distiller's festival (Proof) in Seattle a month or so ago. We don't often drink gin, but this gin is bourbon-barreled gin, and we DO drink bourbon, so we thought we'd give it a shot. Bourbon Barreled Big Gin by Captive Spirits. It's good. Shake over ice and pour into cold martini glasses. Garnish with a large slice of lemon peel.